If you study the way good players hold their picks, plus study method books, as I have for a few decades, you find that there are only a couple of widely-accepted ways of holding a pick. I concluded after practicing with picks for many years, taking lessons from several teachers - plus teaching others how to hold them in countless lessons and classes - to use and recommend one particular way to hold a plectrum. (Plectrum is another word for pick). Out of fairness, I want to be quick to write that there are good players who hold their picks differently than the way I am about to describe, so there's room for individual differences. 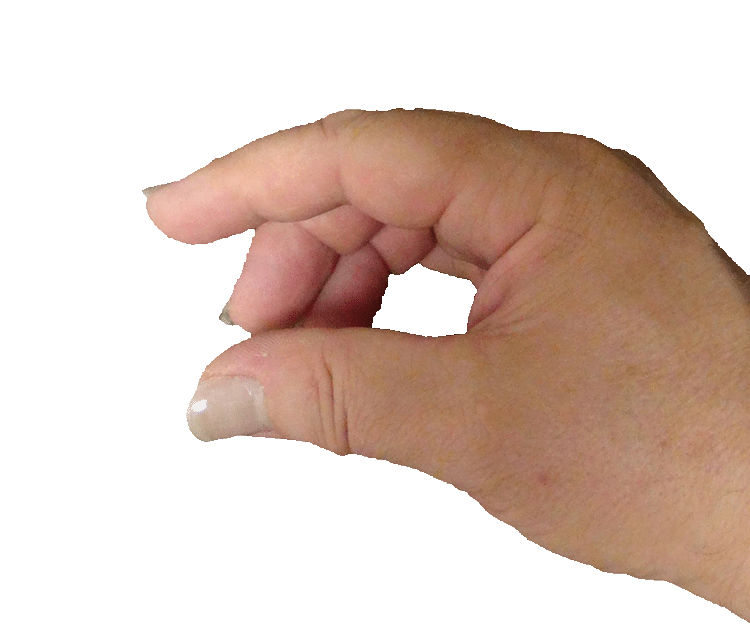 For example, one of my former students used a very large pick and held it between his thumb and middle finger, which is quite unusual. However, he could sweep pick (a very fast way to play the individual notes in chords) with the best of them. So while I very highly recommend that you follow my directions below - mostly because I have decades of experience and training to back them up - you might find a way to hold a pick effectively that provides the exception to the rule. I won't discuss much about how to choose a pick here, because I've covered it at length elsewhere. (You can find a more in-depth article about picks here.) In general though, I recommend smaller, thick picks, rather than bigger, thinner ones. Step One: Start with an extended index finger. Step Two: Bend the two index finger joints nearest to the tip of the finger at nearly right angles. 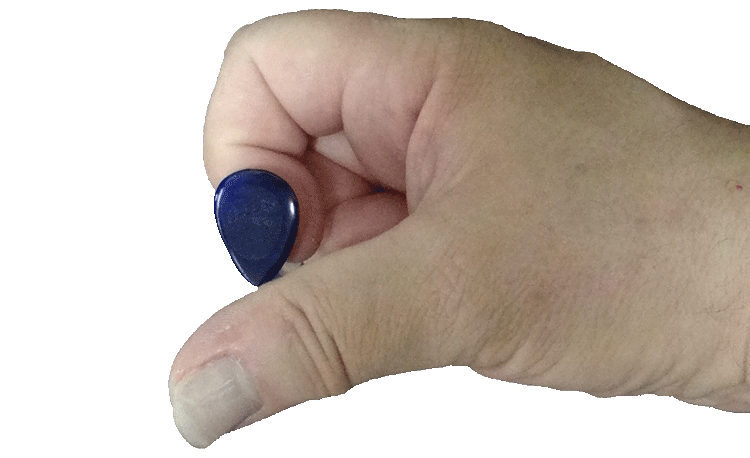 Step Three: Place the pick on the side of the tip segment of your index finger. This part is critical - the pick must be on the side of the finger (this is why you must bend the joints so extremely) and it should touch only the part of the finger that extends from the tip to the first joint. This latter step is why I recommend smaller picks. If the pick is too big it will touch the middle joint of the finger, which will make certain techniques, like circular picking, more difficult, if not impossible. Here are pictures taken at two more angles. If you are new to holding a pick using this particular method, you might find that the pick ends up on the tip of your index finger (rather the side where it should be) after you do some strumming. This is a common problem (and one of the more common alternative ways to hold a pick). If this happens to you, just make sure to keep your index finger joints bent at almost right angles and insist on holding the pick on the side of your index finger. If you allow your index finger to straighten out, the pick will probably end up on the tip of your finger rather than on its side. 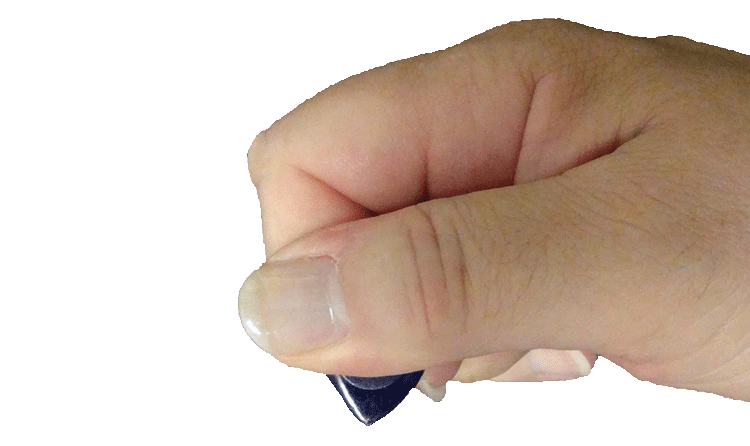 If you stubbornly stick to this method of holding the pick, I can almost guarantee that you will be rewarded. 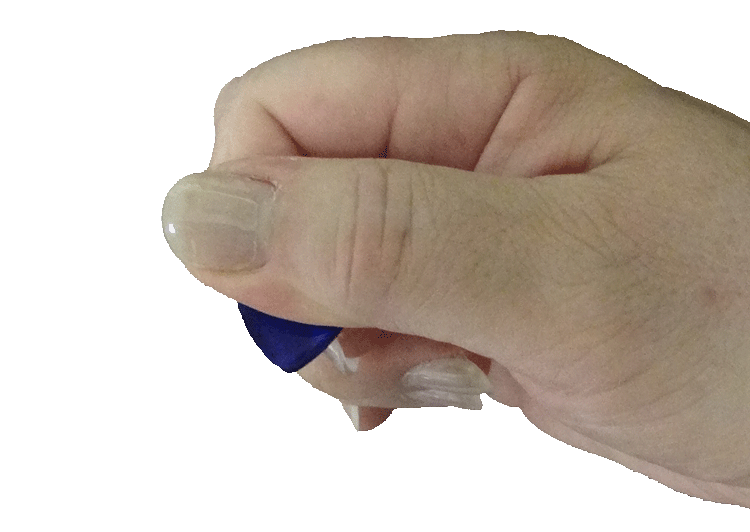 Remember: bend the joints of your index finger and keep them bent so that the pick stays on the side of the finger. Another common error with this particular method of holding the pick is bending your thumb joint too much. Make sure that only the tip segment of your thumb (the part from the tip to the first joint) is holding the pick against your index finger. 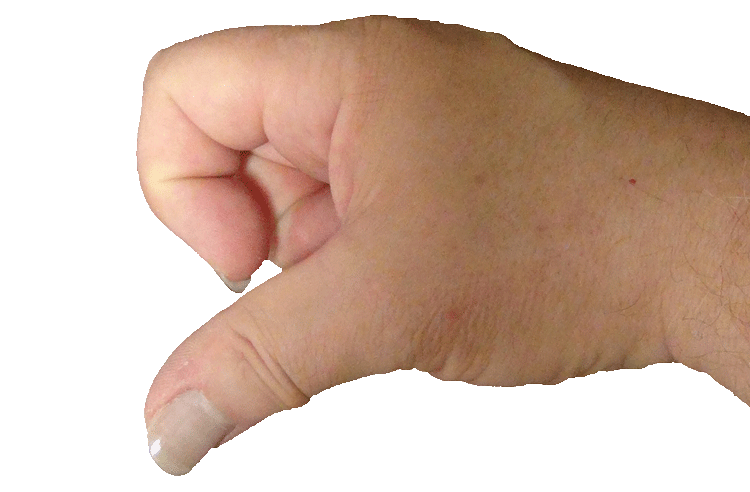 Your thumb should be relatively straight, not bent. 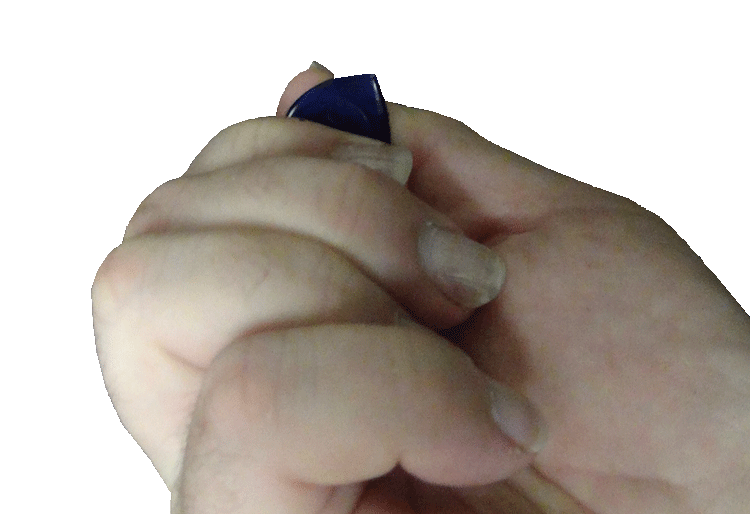 Later on, once you've mastered this particular way of holding your pick, you will be able to use advanced techniques that make use of the flexibility of the joints of your finger and thumb. Allowing the pick to be held with the tip of your finger, rather than the side, might limit your ability to learn these useful advanced picking techniques. But, as I wrote earlier, you might find an alternative method of holding the pick that is more useful for your particular physiology or playing style.